The panda cory or the panda catfish is a South American species of catfish with a black and off-white coloration pattern similar to a giant panda. A generally peaceful, social fish, panda corys can be a good addition for a smaller, freshwater aquarium. This popular Corydoras species originates from Peru, where it is found in the Ucayali river system, the main headwater of the Amazon River. First collected by H.R. Richards in 1968, the species was not given its name until three years later when it was assigned the name Corydoras panda by Nijssen and Isbrücker. The name was given in honor of the giant panda of China, which has a pale body and black markings over the eyes and extremities, which are mirrored in this attractive cory. The region from which the panda cory originates is known for its blackwater conditions. The water is on the acidic side and quite soft due to lack of minerals. Additionally, these waters are a bit cooler than other tropical areas, running in the mid to low 70s on average. When initially introduced to the aquarium hobby, specimens were wild caught, causing them to be rather expensive to purchase. Eventually captive breeding programs greatly reduced the price, and as a result, the species has become not only quite inexpensive but also hugely popular. The body of the panda cory is off-white to a faint pink in color, with three prominent deep black markings. The first begins at the top of the head and covers the eyes, much like the black markings around the eyes of a giant panda. The second black marking covers the dorsal fin, and the third is at the base of the tail, known as the caudal peduncle. The size of this third spot at the base of the tail varies and has given rise to the big-spot and small-spot morphs of this fish, each being named for the size of the tail spot. Like other members of the cory family, this fish has two rows of overlapping bony plates known as scutes, rather than scales. 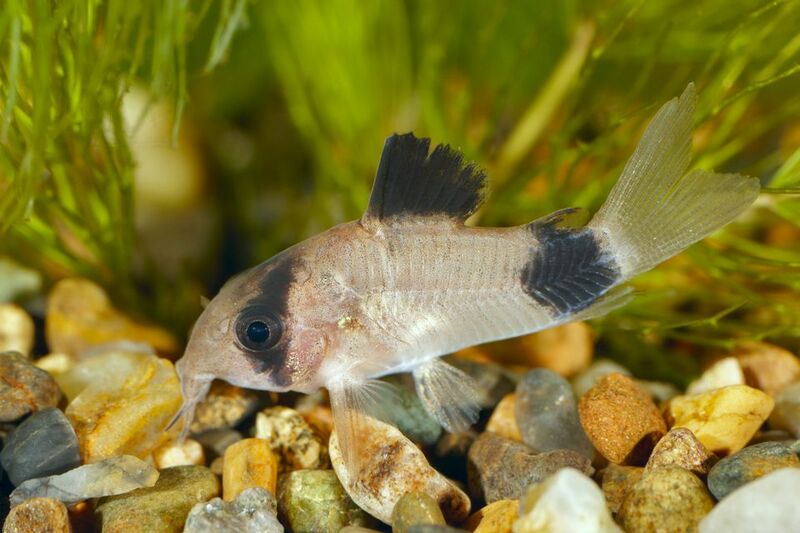 Panda corys have three sets of paired barbels, as well as several sharp barbs that serve as a defense mechanism. One barb is located under each eye, another in front of the dorsal fin, and another on the adipose fin. Adults can grow up to two inches in length, but quite often they remain smaller than that. Panda corys are extremely peaceful fish that enjoy the company of their own kind. They should always be kept in groups, preferably of a half-dozen or more, but at least three or four if space is limited. Pandas corys are highly social and are known to tag along with other bottom-dwelling species, most notably clown loaches. Like other corys, the panda cory needs good water quality. Regular water changes are important, as is a good filtration system. In other words, err on the side of over filtering with this species. Water should be soft and slightly acid to neutral in pH. A water temperature of 72 F for this species is slightly lower than is typical of other warm-water species. This species originates from a region with slightly cooler water than other tropical species. Since almost all panda corys sold now are captive bred, most can tolerate warmer temperatures. The substrate should be soft and fine, either fine gravel or sand. Live plants are ideal, but not required as long as there is plenty of decoration that provides shade and hiding places. Caves, rocks, and driftwood all are excellent ways to make this catfish feel comfortable and at home. Floating plants, either real or artificial, are helpful to provide shade. Panda corys are great scavengers that snap up any food that falls to the bottom. However, if housed in a community tank with other fish, care should be taken to ensure that sufficient food reaches the bottom of the tank for the corys. Sinking food tablets or pellets are a great option. A varied diet is important for optimal health. Include meaty foods when possible, either live or frozen. Shrimp, worms, insects, and any crustaceans are good choices. They seem to be particularly fond of bloodworms, brine shrimp, and daphnia. Several prepared food tablets are formulated specifically for corys and are a great food choice for panda corys. Keep in mind that this species is active at night, so consider dropping a few food tablets in the tank just before turning off the lights for the night. The female panda cory is larger and has a more rounded underbelly, and is much wider than the male when viewed from above. Often the rounded belly of the female causes their head to sit a bit off the bottom of the tank. Makes are more sleek and shorter in length than the females. Breeding of this species was initially thought to be quite difficult, but time has proven that breeding is possible in the home aquarium. The breeding tank should be furnished with Java moss, or other fine leafed plants for the eggs to be deposited upon. The breeders should be well conditioned with live foods, such as bloodworms, brine shrimp or daphnia. Spawning can be triggered by a partial water change with cooler water to mimic breeding conditions in nature that occur during the rainy season. When the female is ripe with eggs, she will accept the advances of the male, and they will assume the classic "T" position seen in many Corydoras species. The female will cup her pelvic fins together and drop one or two eggs, which are subsequently fertilized. She then seeks a place to hide the sticky egg, generally on vegetation. This process will continue for several hours until as many as 100 eggs are laid and fertilized. These eggs are adhesive and light yellow in color. In approximately four days the eggs will hatch. They are quite sensitive to water temperatures, which should be no higher than 72 F. Fry do best with infusoria, but may also be fed commercially prepared fry foods if necessary. Water quality is critical, and water changes should be performed only with water that exactly matches the water parameters of the fry tank. It will take up to three months before the fry achieves the panda coloration of the adults.